What is it? The Skirmish in Balin's Tomb should be familiar to anyone who has watched The Fellowship of the Ring. Deep within the Mines of Moira, perpetual comic relief Pippin knocks a body down a well, and the ensuing racket brings goblins by the hundreds bashing at the door. It's Adventuring 101 really, don't make a ruckus anywhere sunlight can't reach. Clank! from Renegade Game Studios, is basically your final exam on this lesson - pass and both wealth and fame are yours for the keeping, fail and well, let's just say Smaug isn't the only cave dwelling dragon you don't want to mess with. We recently reviewed the rather popular deck-builder hybrid Tyrants of the Underdark, and in a plot twist that’s become known in the industry as pulling an SUSD, we proved incapable of seeing what everyone else seems to see so clearly. Fortunately since we have awesome readers, rather than having to quell an uprising our punishment was simply a good natured ribbing. And for the record, Paul and Quinns are TOTALLY wrong about Scythe and did they even play the same game and how dare they express such an unerringly BAD opinion? But I’m not here to wake sleeping dragons of the metaphorical persuasion – there’s a far more clear and present danger slumbering in the depths, and if you hope to make it back to the surface with enough bejeweled artifacts to retire on, you’d best step light and step quick. Clank! 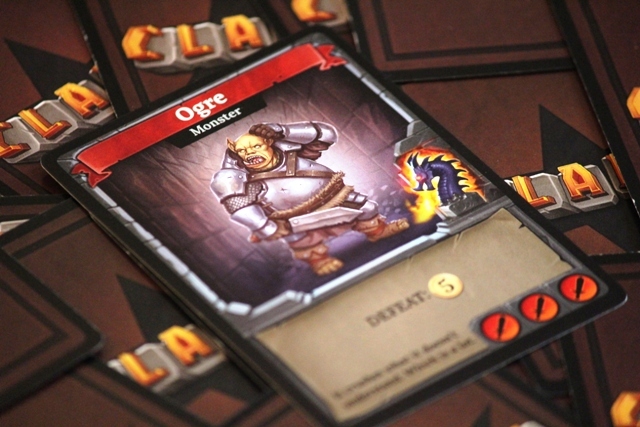 is a 2 – 4 player deck-builder that casts you in the role of the Realm’s greatest burglars. Well, technically there is an App that allows for solo play, but we’re not looking at this for the purposes of this review. I imagine that these burglars spent the night before, drowning themselves in ale at some appropriately seedy tavern, boasting about exploits and profitable heists. Things get a tad heated, egos prickle like the quills of a porcupine and now they’re in some dank cavern miles below ground, tired, hot and with the ominous sounds of quickened breathing making the cavern floor tremble. So what sets the greatest burglar apart from the chasing pack? Quite simply, who has the most loot at the game’s end! Which is all well and fine, but how do you go about accumulating said loot? Your tales of derring-do are driven by your deck of cards, which operates according to fairly standard deck-building rules. Everyone starts out with a basic deck, and you acquire cards with benefits as the game goes on. Draw 5 cards, perform their actions, discard everything, draw back up to 5. Rinse, repeat. Actions come in three flavours, namely Skill, Swords and Boots. 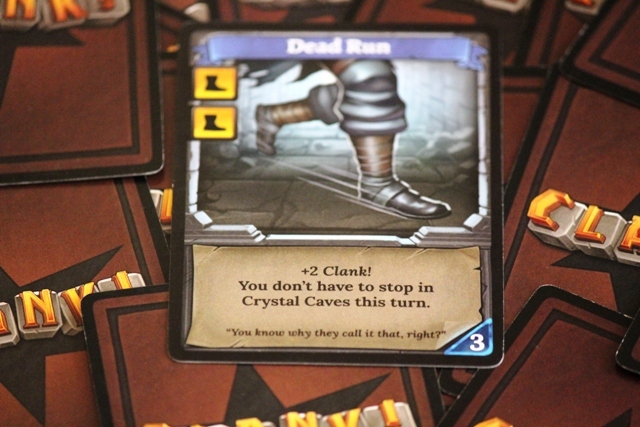 Skill is the currency with which to purchase new cards from the Dungeon Deck, which provides six options at the start of each turn, in addition to the Reserve row which always has four card-types on offer. Swords are your combat currency, used to defeat monsters in the Dungeon Deck and to move through monster-guarded paths on the gameboard, and lastly Boots are your movement currency, allowing you to move between board locations. A typical turn consists of moving from one hazardous cavern to the next, perhaps killing off a monster or two and adding to your hand all manner of weapons, companions, jewels or devices to aid you on your greedy quest. But it’s hard for even the most adroit thief to avoid making a noise in such dimly lit and precarious conditions – enter the titular Clank resource. 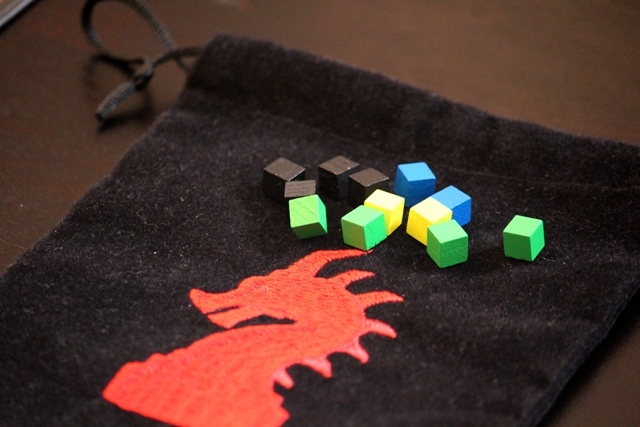 At the start of the game, 24 innocuous black cubes are added to a lovely Dragon bag, and players receive the rather less innocuous 30 Clank cubes in their colour of choice. When a card instructs you to add Clank, you’ll place the requisite number of dastardly cubes into the Clank space on the board. Certain cards in the Dungeon Deck have a Dragon symbol, and when this is revealed the dragon rouses to attack. 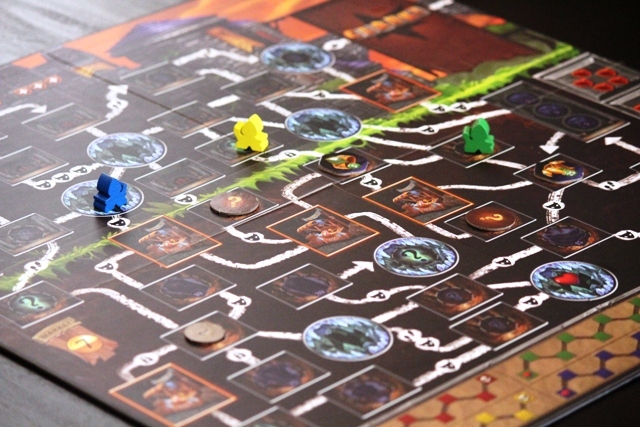 All Clank in that space is added to the bag, and depending on where the Dragon marker is on the Rage track, the active player draws between two to five cubes from the bag. Black cubes are harmless and discarded from play, but any Clank cubes revealed are added to the health track of the matching colour. If at any time a player’s health track is maxed out, that player is then knocked out. 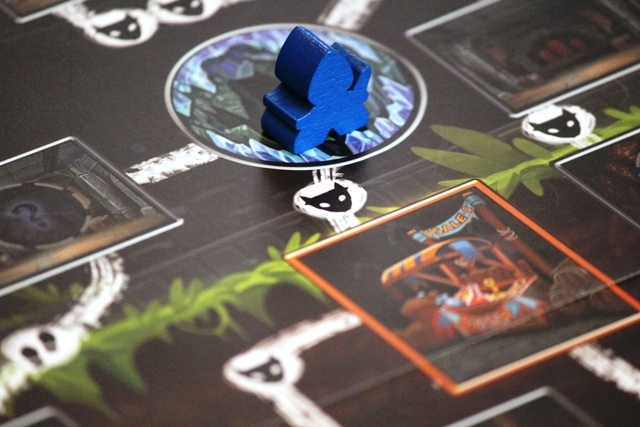 If they have an Artifact and have managed to escape the Depths (indicated by the green line of foliage on the board), that player is considered rescued by the villagers and will tally their score at the end of the game. However, get knocked out before you’ve snagged an Artifact or managed to escape from the castle completely, and you’re out of the game. Ah yes, those gleaming Artifacts. Seven of them to be exact, ranging wildly in point values from as little as 5 to as many as 30 (6 Artifacts in a 3 player game, 5 in a 2 player game). These are placed in the indicated spots on the board during setup, and as you may deduce, the more valuable Artifacts are always the furthest from the surface. Don’t despair however, as locations may also provide Major or Minor secrets. These are added to the board facedown at random- anything from healing potions to chalices worth 7 points to potions of strength and swiftness. Players may only retrieve one Artifact over the course of a game, unless they manage to purchase a backpack which allows you to carry an additional Artifact and is also worth points. These backpacks, along with a Master key and Crowns can be purchased from Market locations at the cost of 7 each. But keep in mind, each time an Artifact is pilfered, the Rage track increases. The Rage track. Only three cubes. For the moment. Successfully escape with an Artifact, and you’ll also get a Mastery token worth 20 points, and the first thief to escape activates the Countdown track. Instead of drawing cards on their next turn, the only action they perform is to move their Pawn to the next spot on the track. This basically provides all players still in the dungeon with three rounds to escape, only the Dragon attacks each round with increasing ferocity. Once the last space on the Countdown track is reached, the Dragon has had enough of your puny human foibles and instantly knocks out all player in the dungeon. I assume with the terrible gaseous aftermath of a spicy curry. I hear dragons have a thing for a good curry. So why did I almost immediately take to Clank with a vigour Tyrants never quite seemed to muster? The deck-building aspects are not dissimilar, if anything Tyrants arguably has a greater variety of cards on offer and is the more fully formed of the two. 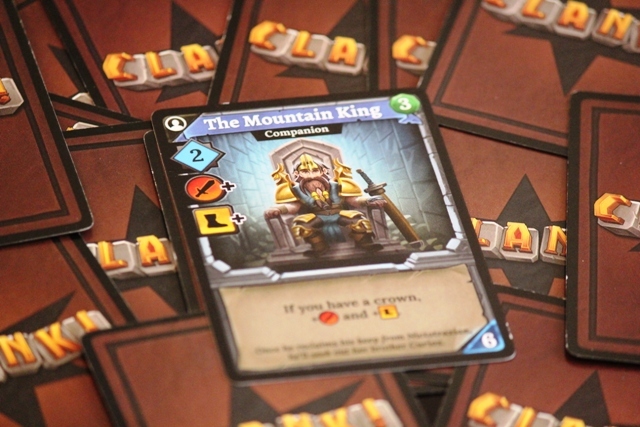 Where Tyrants is very much about formulating a specific plan of attack and nursing that strategy to victory, Clank is all about reacting in the moment. You’ll have a general idea of where your want to go in the dungeon, but circumstances can change very quickly (like having the Artifact you’re attempting to steal snatched from under your nose by another player). I’ve read plenty of talk around how well Tyrants two hybrid halves mesh together, but nay friends, Clank is the true successor to that particular throne. Paul Dennen has absolutely nailed this design – we felt constantly engaged and challenged by the action taking place on the board, working out optimal routes and attempting to account for potential pitfalls, watching our opponents movements as they edge toward that last available backpack. Do I move through that route guarded by two monsters even though I don’t have Swords, taking the damage instead? How long do I risk staying in the Depths for? Do I take the easier 15 point Artifact and augment it with smaller treasures, or make a beeline for the 25 point Artifact and focus on hightailing it back to the surface? 2 Skill is decent enough, but if you snag a Crown that extra combat and movement make for a very versatile card. And worth 3 vp to boot! The deck-building, while not robust, still offers enough variation to gear up different strategies, whether that’s a focus on high maneuverability, card draw or a gold generating engine. There are also ways to cull your deck, in particular your discard pile, which is fantastic for discarding the Clank cards that are no longer of sufficient value. You will also experience the odd turn where your cards combine majestically, but combos aren’t a major focus so if you particularly enjoy that aspect you may be a tad disappointed. Certain cards also carry a point value, some in addition to their abilities and others such as the Secret Tome cards which just award points but otherwise clog up your deck. Importantly though, and for me a slight misstep, is that monsters in the Dungeon deck don’t provide victory points, but instead award gold or Skill or card draw. I get that the game’s focus is on thievery and not monster bashing, but if you’re going to include so many monsters and powerful weapons, it does seem like an oversight that you can’t pursue a combat build as a valid means of racking up points. And although as I said culling exists, you could well hit the last few rounds of the game drawing low level cards that leave you with few options. If you’re unlikely to survive the next Dragon attack and only need a single Boot to make it out, drawing a handful of Skill isn’t much fun. Personally, I just view this as part of risk management and the natural consequence of poor purchasing decisions, but I can understand how it might prove an ungainly obstacle for some. It’s a bag. But it’s also the dreaded maw of a fire-breathing dragon. But those are really the only blemishes in what is otherwise a tremendously entertaining experience. 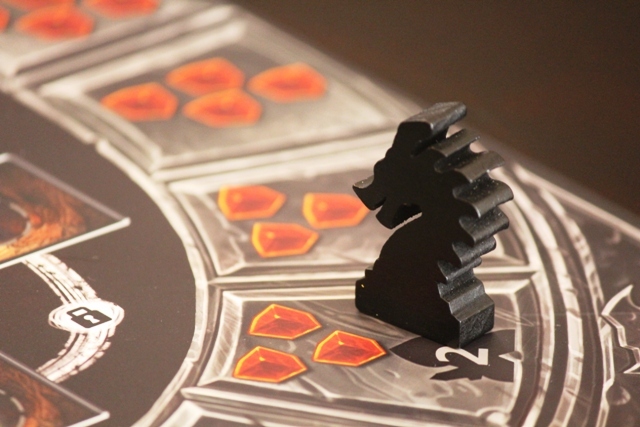 Drawing Clank from the bag offers just the right amount of tension, and the ramping up of the Rage track and the dwindling number of neutral black cubes is a smart way of upping the risk toward the endgame. Thematically, every aspect contributes toward anchoring the gameplay to the setting. One of my issues with Tyrants was that aside from the artwork, I didn’t feel particularly connected to the theme. But with Clank, I cannot separate the two. I am right there on that board, sneaking through caverns or kicking up a racket as a I sprint to another chamber, stumbling across a Monkey Shrine or a Cave Troll. And for those concerned about the fact that Clank has player elimination, don’t think of it as being cruelly tossed from the game with half an hour to go, being forced to watch everyone else have a good time. Firstly, if you do happen to get knocked out in the Depths and without an Artifact, that’s only likely to happen in the dying moments, and perhaps more importantly it’s because you decided to take the risk and not because of some cruel twist of fate or a devious opponent. Whilst Clank plays very well at all player counts, I do think the advertised playing time is optimistic. With three or more you’re far more likely to hit the 90 minute mark, and because there isn’t a set number of rounds, if no one makes a break for the surface the game could drag on. Get it? DRAG ON. I don’t really see this as much of an issue though because of the 20 point incentive to get back to the surface and the fact that the longer you stay out, the more likely you are to get knocked out. There’s also a lingering doubt in my mind about longevity. I’ve unfortunately been burned before by games whose initial few plays are filled with wide-eyed wonder, only for the lustre to dull over time. I do think that Clank is going to sink or swim based on the strength and frequency of its expansions, which is certainly something to keep in mind. Thankfully, there’s already an expansion available that not only adds new cards, but a new double-sided board as well. And it’s underwater. The Crystal Cavern the Blue player is currently ends halts all movement. Perhaps not a bad thing, since moving to the Market will cost either 1 Sword or 1 damage. So with that in mind, I’m going to have to brave death by dragon incineration and give Clank a very noisy recommendation. For our money, it’s the best deck-builder-with-a-board hybrid around. Its thematic richness, wide appeal and engaging gameplay has been a hit with everyone around the table, and even Stuart’s deckbuilder jadedness was banished to the depths, if only for a few hours. 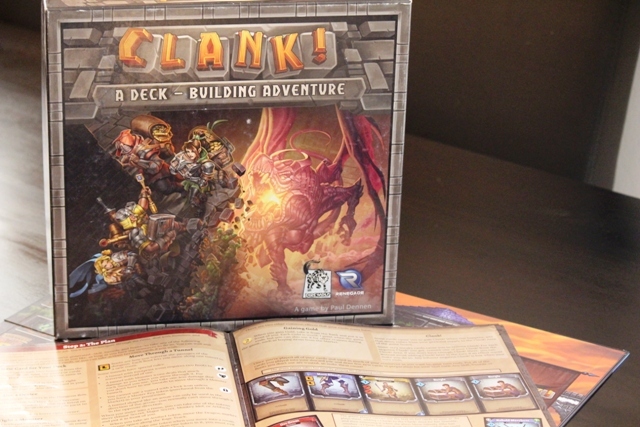 Review copy of Clank! kindly provided by Solarpop. I went into Clank with both high expectations and a rather critical mindset, both of which were summarily dealt with less than halfway through the game. Given the proliferation of deck-builders, shifting the emphasis more toward the action happening on the board rather than actual deck-building feels like the smart call. Pulling Clank cubes from the bag never gets old, and given enough expansions, getting this game to the table shouldn't either.